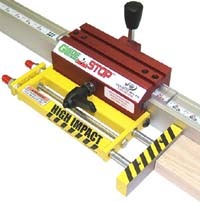 The Combination miter fence allows for both inside and outside miter cuts as well as 90° cuts. 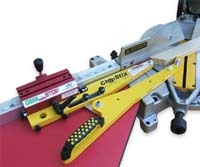 The Gang Fence extends the contact area of the GlideStop 12" from the fence for multi-piece cutting. 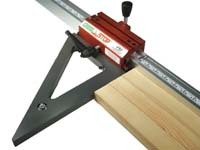 Great for Radial Arm Saws. The Pneumatic Package allows the user to remotely engage or by-pass stop indexes via work station foot pedal. This system is ideal for: spaced dadoes, spaced boring and mortising. 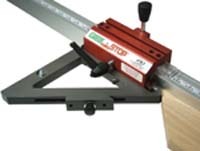 The Digital Package mounts directly to the Glidestop for either right or left hand applications. The system is highly accurate and features three display modes (decimal, fractional and metric). the ZeroBlock attaches for precise part measurements. Simply put: The ChopStix keeps you hands away from the cutter while machining small parts. It quickly attaches, and detaches from the GlideStop for ease of use. The high impact takes the shock out of heavy materials. This accessory enhances the GlideStop's considerable holding power.